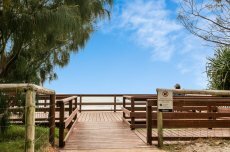 Situated approximately half way along the Gold Coast’s world famous 70km stretch of golden coastline, Burleigh Heads is the ideal holiday base for anyone who wants to soak up all that Australia’s playground has to offer. You’ll find everything from Seafood, to contemporary Australian cuisine on offer at the cafes and restaurants that are around every corner, it seems, in Burleigh Heads. While Broadbeach, the region’s undisputed culinary capital, is just ten minutes drive away. Those that crave retail therapy are just as well catered for as food lovers with the huge Pacific Fair Shopping Centre, Cavill Avenue and Robina Shopping Centre all less than 20 minutes drive from our door. Situated only 50 metres from our Gold Coast family resort, Burleigh Heads Beach is famous for its superb swimming, body boarding and surfing conditions. The north-facing beach was voted one of the best beaches in Australia by TripAdvisor users in 2012, and with its pristine golden sands and lush parkland backdrop it’s not hard to see why. If you can drag yourself away from the sand and surf, you will find a world of ancient rainforests, hidden caves and waterfalls just waiting to be explored in the Gold Coast hinterland, just a short drive from the resort. Burleigh has some beautiful markets for the bargin hunter, collector, fashionista and the foodie alike. Check out the monthly beach side markets along the Esplande on the last Sunday of each month. The Village Markets are on every second Sunday offering fashion, jewellery, recycled collectables and clothing as well as food and music and the Farmers Markets are on every Saturday. Ask reception for more details on these markets as they are a great way to spend your day. Thrill seeking families are spoilt for choice for great days out at Horizons Holiday Apartments, with all of the Gold Coast’s most famous theme parks and visitor attractions within easy reach. You can spend a day amongst native wildlife at the award winning Currumbin Wildlife Sanctuary, discover the rides at Dream World, enjoy a night out to remember at Dracula’s Cabaret Restaurant and get up close to the only polar bears in Australia at Sea World!